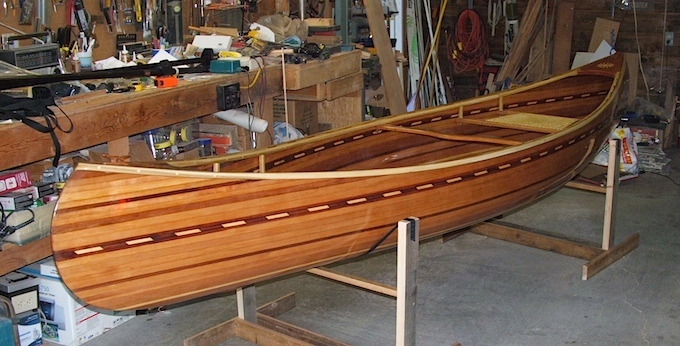 In this picture the seats, decks, yoke and gunwales have been installed. They were installed after the inside had been sanded and varnished three times. Probably the most difficult part of the whole job has been sanding the inside. This is due to the accumulation of glue on the inside during the cedar stripping. Excess glue is wiped off the outside with a damp cloth, but it is sometimes hard to get a hand up under the strips. Also, the deep confined spaces at the stems are difficult areas to work and see at the same time. Much of the inside sanding was done by hand. 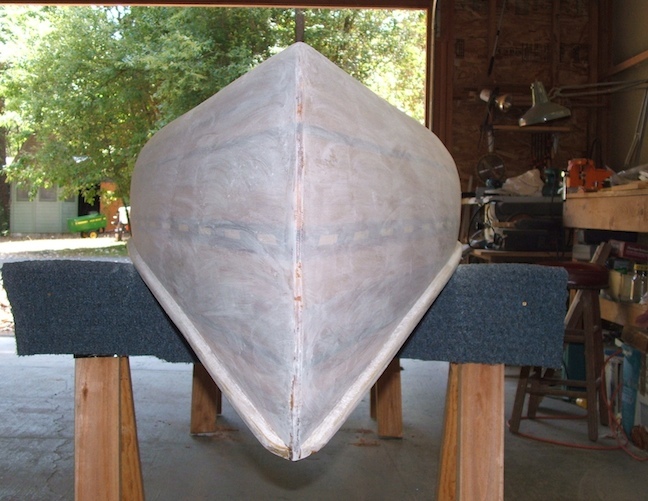 Here she is, upside-down again and all white from another sanding episode. This was the final sanding before the first coat of varnish on the outside. It was sanded with #150 sandpaper before working the inside; this time with #220 paper. The dust will be vacuumed off the hull and the surface wiped down with a paint thinner dampened cloth. Then, just befors varnishing, the surface will br wiped again with a tack cloth. The varnishing process for the outside of Sunshine was much the same as for the inside, except easier. 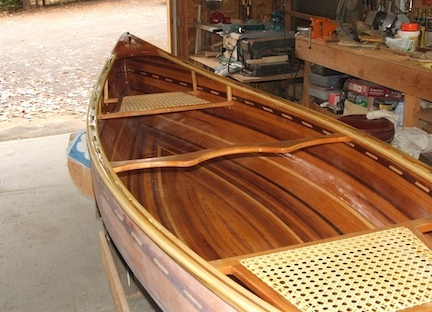 I had sanded the epoxy surface of the outside while the canoe was still on the molds. Now all that was needed was a light sanding with #220 sandpaper. After sanding I vacuumed, wiped down with a cloth dampened in paint thinner and wiped it again with tack cloths. Then, the varnish with a fine bristle 3" brush. All this was done two more times. Here she is in her cradle. I think she wants to get out of this garage and find some water..., a lake.